and HUMATE Sales support environmental projects. Go to the page #2 HUMATE Order Page, to start your delivery. Can thoughtful, committed people change the World? "Help me Save my Friends "
biological Humic Acid and Fulvic Acid Fertilizers, made from Nature's own Organic Humate. The GREEN + CROSS is a registered 501 (c) (3) Charitable Project Fund. The GREEN CROSS works to Change the Cause and the Direction of the Earth's present Environmental Deterioration. Only with a highly concentrated approach to Environmental Project Funding, can sufficient financial resources be gathered, to make a Real, Verifiable, Net Positive Improvement. The GREEN CROSS, with the Broad Support of the Public, Private and Business Sectors, accomplishes this goal, by delivering sufficient and trusted Environmental Relief and Project Funding. Please join The GREEN CROSS, in Achieving our common interests. AN ORGANIZATION YOU CAN BE PROUD OF, " EARTH's BEST FRIEND ". The Green Cross remains neutral, and is not politically affiliated. Every journey begins with its first step. 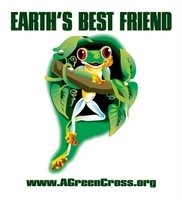 Please join The Green Cross, to make a real Environmental difference, now. The Golden Toad is already Extinct . The Polar Bear will become extinct in just a few years , if the Ice melts and Polar Bears can not hunt seals from ice . No ice to raft from , and Polar Bears will drown . Who caused the ice to melt ? You and me . Human Over Population of the Earth is the biggest Threat to ourselves and to all other Creatures ! that holds evidence of climate conditions for the last 68,000 years , and shows that Greenhouse gasses are now at the highest level in 800,000. years . N.A.S.A. Scientists say we must halt greenhouse gas and reverse them within two decades, or watch the planet spiral towards destruction . We can make a difference, And we will. In collaboration with the Renewable Energy Resources Committee of the American Bar Association ( ABA).